[September 25, 2013] If employees enjoy coming to work and customers are pleased with your product and services, then you have a positive organizational culture. 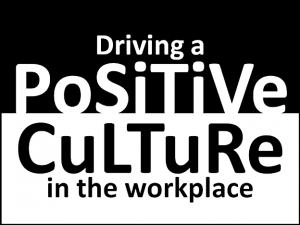 A positive, healthy culture is the basis for improving your organization’s competitive edge. The most senior executive leaders have the responsibility to drive their organizational culture in a positive direction. While this is done in several ways, for example through a well developed strategy, leaders must be careful to closely observe and manage it. While it is generally agreed that a positive organizational culture is best to achieve the organization’s mission and leader vision, consensus on “how” to achieve it varies dramatically. The fact that so many cultures do not fully achieve their mission and vision means that there must be some significant obstacles. The two most significant obstacles to a positive organizational culture are lack of leader knowledge and difficulty in implementation of workable methodologies. Many agree that the lack of knowledge is the least problematic. By the time senior leaders reach their positions, typically they have gained the right stuff to ensure some level of workable methods of a successful organizational culture. It is difficult to implement certain methods to achieve a positive culture because it requires dedicated resources and a strong senior executive leader and leader teams. Increase employee motivation and passion. Develop team building and collaboration. Build employee resilience and professionalism. Encourage openness and respect for others. Teach and encourage the Right Values. Execution. The main variable that helps ensure a positive culture is a team of senior executive leaders that have the will, knowledge, and resources (time, people, dollars). It is the “will” that is often lacking. The focus in many senior leaders is often short-term, while a positive culture, of course, demands a long-term approach. Organizational cultures take time to influence and this means senior leaders must focus over an long period when short term demands are hard to ignore and must be balanced. This is why senior leaders must be aware that urgent issues (short term gain) are to be managed so they do not overcome the important (long term organization health). Being able to be successful with shorter term organizational gains, while managing long-term culture is difficult, but achievable in any organization. Making positive changes1to an existing organization is achievable with the right senior leader. Only a top-down approach can work. The most senior leader must be fully committed or organizational health will suffer. “Who Moved my Cheese? : An Amazing Way to Deal with Change in Your Work and in You.” Spencer Johnson.